The Old Hall Coach House in Tacolneston, near Wymondham, Norfolk sleeps 6 people. The Old Hall Coach House near Wymondham was built and designed by a member of the Kings Council; this lovely detached property still has many original features including beamed walls and ceilings. Renovated to a very good standard by the current owners, it has been stylishly decorated and furnished to provide beautiful and relaxing accommodation for discerning guests. 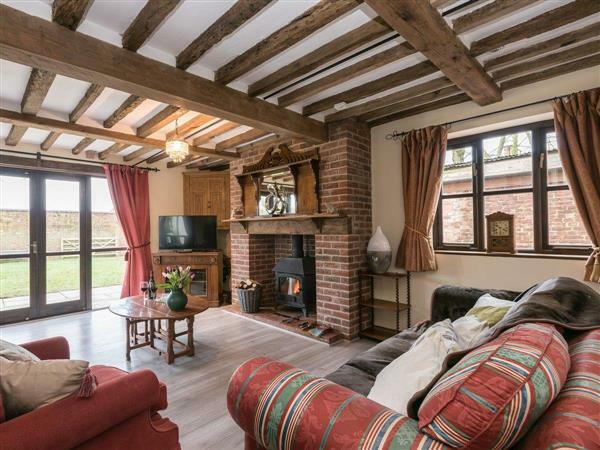 It enjoys the perfect position to explore the area, and close by lies the bustling market town of Wymondham, which offers lots of great places where you can eat and shop, along with an indoor swimming pool. It’s worth taking the time to visit picturesque Wymondham Abbey, a magnificent Norman church established in 1107 as part of a monastic foundation. You can be in the medieval city of Norwich in 20 minutes. Here you will find the finest standing example of a Norman castle in the whole of the UK, numerous museums, leisure activities, shops and eateries. For a change of pace, head to Thetford Forest with High Lodge (a recreational site with walks and cycle trails) and Go Ape (treetop adventures). In just under 40 minutes you can also be at the gateway to the Norfolk Broads, where you can charter a day boat or join an organised tour. You can also visit the east coast at picturesque Winterton or Great Yarmouth, where you will discover all the fun of fair and glorious beaches. Head east or west from here and you will find a string of seaside towns and villages to explore and enjoy. Add in several National Trust properties, excellent museums and birdwatching activities, and you will soon see why this part of Norfolk is so popular with guests who return year after year - and, you will be sure to return to The Old Hall Coach House too. The beach is 28 miles from The Old Hall Coach House near Wymondham. With the shop 4 miles, and the pub & restaurant are 1 mile from The Old Hall Coach House. Living/dining room: With wood burner, 40 Freeview TV, DVD player, double sofa bed (for flexible sleeping arrangements), beams and wooden floor. Kitchen: With electric cooker, microwave, fridge, dishwasher, washing machine and beams. Bedroom 1: With king-size bed, Freeview TV and slipper bath. Bedroom 3: Galleried with king-size bed. Oil underfloor central heating, electricity, bed linen, towels and Wi-Fi included. Initial logs for wood burner included. Travel cot, highchair and stairgate. Welcome pack. Lawned garden with sitting-out area and garden furniture. Hot tub for 6 (private). Bike store. Private parking for 3 cars. No smoking. Holidays at The Old Hall Coach House run from Friday to Friday. Pets allowed at The Old Hall Coach House. For a better idea of where The Old Hall Coach House is, you can see The Old Hall Coach House on the map below. The Old Hall Coach House is in Norfolk; should you be on the lookout for a special offer, you can find all the special offers in Norfolk. It's always worth checking to see what is on offer at the moment. Do you want to holiday near The Old Hall Coach House (UKC2928), you can see other cottages within 25 miles of The Old Hall Coach House; have a look to find your perfect holiday location.